Our modern, spacious workshop facilities are equipped to deal with regular servicing and any repair work. 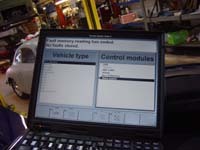 We have full Porsche diagnostic and code reading equipment, plus a state-of-the-art Porsche approved Sun System for full four wheel alignment, with live 4 wheel tracking camber and caster, with reporting for your peace of mind. We deal with several U.S. based companies and can source those hard to get parts, Webber carb parts, brake upgrades and early car parts etc. We can also upgrade your lighting using our new xenon light upgrades available for all bulb types and with several different ranges of Luxx. We also offer tyres at very competitive rates through our network of suppliers and are official agents for Eibach and B&M Shifters. Wherever possible we use only oe parts in your car, which we are able to source from our network of suppliers around the globe. We won't suggest you bolt on goodies unless they enhance the performance of your car and are a sensitive fit to its original design. Our pricing also reflects our commitment to service and is tailored for each job, we don't charge flat fees, you only pay for what you need and what you get.